Xaero-B, a prototype launch vehicle built by the company Masten Space Systems in Mojave, California, takes a tethered test flight in this image released on July 17, 2014. Masten Space Systems is one of three companies working on designs for the U.S. military's new XS-1 experimental space plane. MOJAVE, California — When Dave Masten, founder of California-based aerospace startup company Masten Space Systems, read the requirements for the U.S. military's Experimental Spaceplane (XS-1), there was one requirement he knew his company could definitely meet: flying 10 times in 10 days. "We really emphasized the fact that we're flying regularly, that we've actually already met their 10 flights in 10 days with actually three of our vehicles now, including Xombie, Xoie and Xaero," Masten said. "All three vehicles did 10 flights in 10 days or better." DARPA's goal for the XS-1 program is to develop a fully reusable unmanned vehicle with aircraftlike operations capable of delivering payloads weighing 3,000 to 5,000 lbs. (1,360 to 2,270 kilograms) to orbit for less than $5 million per flight. The program's technical goals include flying beyond Mach 10 (10 times the speed of sound) at least once and launching a representative small payload to orbit. The $3 million contract was a big one for Masten Space Systems, which has fewer than 20 employees and is headquartered in a small, warehouselike building at the Mojave Air and Space Port in Southern California. But you can't judge an aerospace company and its technology by size alone. In fact, Masten said that his company's small size is actually an advantage for technology efforts like the XS-1 space plane program. "We also emphasized [to DARPA] the fact that we're using very small crews to do the flights," Masten said. "And we believe that's scalable to the XS-1." Masten has spent years flying various small VTVL systems on a series of short hops at the Mojave spaceport. The systems have served as test beds for guidance, navigation and control (GNC) systems designed to safely land spacecraft on the moon and other worlds. "We're leveraging what we've been doing for years," said Masten Space Systems CEO Sean Mahoney. "So, in some ways, this is larger and more aggressive than stuff that we've done before, but on the other hand, it is squarely in line with what Dave's vision was from the start." "To borrow from aviation history, Xombie and Xaero are biplanes," Masten added. "And now it's time for our Tri-Motors and DC-3s. That's what this really represents." Artist's concept of Masten Space System's design for DARPA's XS-1 reusable space plane. The company has released an artist's conception of its XS-1 entry. The artwork shows a VTVL system taking off vertically from a launchpad with wings and a tail fin, which are elements that are not standard on any of the company's previous vehicles. "It's an artist's representation, and so the purpose of Phase 1 is to come to a design, and we're going through a lot of different design ideas as part of that phase," Mahoney explained. "What it will do is meet the requirements that DARPA set out ... There are several different key things that you have to do, and it has to be economical as well, so we're trying to find the best combination of all those things." 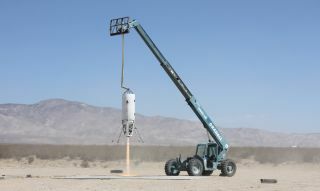 The Mojave, California-based Masten Space Systems has been developing vertical launch and landing vehicles such as Xombie, pictured here. The company is one of three drawing up designs for the experimental XS-1 military space plane under a DARPA project. "The purpose of Phase 1 is taking the concept we proposed on how we would meet the requirements and refining it to the point where we actually have a plan on how we would execute," he added. Masten said that wings could end up staying in the final design. Wings are "a possible way of meeting some economies and operational requirements, even though we're not going to touch down on a runway ever," he said. "It's still vertical takeoff, vertical landing. The idea of the wings is to get a little bit of extra lift so we can do return to launch site. We can go off, we can do cross-range, we can turn ourselves around. We can use aerodynamics to do some of the work for us." Masten has partnered with another Mojave company, XCOR Aerospace, which will provide the propulsion system for the reusable XS-1 vehicle. XCOR is working on a design for a fully reusable orbital system of its own. "Twelve months is going to be quick and difficult," Masten admitted. "This is going to be fun. Actually, I shouldn't say this is going to be fun, because I'm already working on it. This is fun."